KIMO’S HOLIDAY DOUBLE ALBUM SET! TWO ALBUMS - ONE PRICE! This holiday-themed album compliments the season with warm, engaging and exquisitely-recorded acoustic guitar in the Hawaiian slack key tradition. 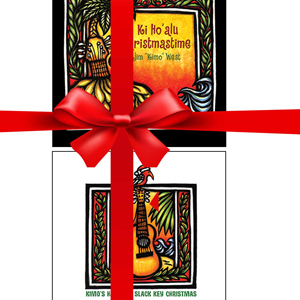 This classic holiday album offers warm and soothing Hawaiian slack key guitar arrangements of traditional and contemporary Christmas songs-let Kimo's "nahenahe" sound be the soundtrack for your holidays. READ REVIEWThis album has become the go-to for relaxing music in our house. We enjoyed Jim's Christmas albums so much that we used to listen to them year-round. Now, we listen to this and save the Christmas albums for the holiday season. The music is gorgeous and it is beautifully recorded. I also listen to it almost every night as I go to sleep. I can't recommend it enough...and if you like Christmas music, I highly recommend his two Christmas albums as well. - Jake C.
Released February 2018, Moku Maluhia (Peaceful Island) features an all-original playlist of super-relaxing slack key guitar with guest appearances by George Abe on shakuhachi and Simone Vitucci on cello. NOTE: Instant download purchases are provided as a hi-fidelity MP3 (256kbps) zip file. READ REVIEWLike many people, I came to appreciate Jim “Kimo” West through his 40 years of work with “Weird Al” Yankovic. But I recently got turned onto slack key music and discovered that Jim is one of the best and most prolific slack key guitarists around. This new album pairs Jim with another fantastic instrumentalist, slide guitarist Ken Emerson, and is it highly enjoyable. For the most part the mood is laid back and breezy, but before the disc has a chance to lose your attention, these guys change gears and kick it into ragtime, jazz, polka and even a cover of The Rolling Stones’ "Ruby Tuesday." There’s a real sense of fun that runs throughout the album. On a technical note, the album sounds amazing — clear as a bell — which makes one appreciate their finesse all the more. I think it’s safe to say that as good as they are on their own, this album of duets is twice as good! - Greg G.
The first-ever duet album from these two masters of Hawaiian slack key and steel guitar conjures a treasure trove of island music from Hawaiian folk to ragtime, blues, Hawaiian jazz and even polka! Slack key master, producer and composer, Jim "Kimo" West is well known as long-time guitarist for the world s foremost musical satirist, Weird Al Yankovic, who makes an accordion cameo on the Slack Key Polka. Legendary slack and steel guitarist Ken Emerson has a rich musical heritage, having performed and recorded with many iconic Hawaiian. Besides a number of new original pieces this recording includes some vintage Hawaiian jazz such as Hapa Haole Hula Girl, as well as the Fats Waller classic Lulu's Back In Town and even a Rolling Stones cover of Ruby Tuesday played on two slack key guitars. READ REVIEWAs a fan of Jim's, I already had high expectations for Guitar Stories. Not only was I not disappointed, but it turned out to be my favorite album to date! The incorporation of stringed and percussive instruments, steel guitar and other effects certainly compliments this gentle style of music. Worthy of particular mention (in my humble opinion) are Mauna Kea Meditation and Mele Menehune. Well-composed, well-arranged, well-played and hauntingly beautiful... though the same could be said for the other tracks, as it took quite a few listens before I would even commit myself to a top two, which will undoubtedly change over time (Iolani Palace Waltz is also competing for a top spot, Morning Music keeps getting stuck in my head, and for something completely different, El Alcázar!). Slack key and beyond. Highly recommended. - Kat O. Best known for his Hawaiian slack key guitar releases, Jim "Kimo" West brings a world of influences to this recording. The sonic palette reaches from contemporary Hawaiian to Middle Eastern, Andalusian, West African, Americana and orchestral, all complimented by a stellar cast of players on steel guitar, cello, violin, viola, flute, percussion and upright bass with Kimo performing on acoustic and electric guitars, baritone guitar, Moog guitar, electric bass and more. READ REVIEWHawaiian fingerstyle slack-key guitar has been growing on me and today I started my morning commute with this CD. What a beautiful way to celebrate the day. After work the CD helped me slip into the slack-key world and relax as the rain fell on our valley. The only way this could have been better would be if I was sitting on a Lanai on Kauai and watching the waves roll in. What a great addition to my eclectic collection. Tranquility as well as transcendent bliss rolled around today with this CD. - Sharon A. The skies of Maui are ever-changing, dramatic and full of surprise, just like life itself. This collection of traditional and contemporary Hawaiian "slack key" guitar instrumentals speaks of the warm trade winds, sparkling blue oceans and the peaceful sunsets that are part of everyday life in Hawai'i. Even older than the blues, Hawaiian slack key has it's roots in 1830's Hawaii, when guitars were first brought by Spanish "vaquieros" who came over to teach Hawaiians about managing cattle. Jim "Kimo" West has been playing and recording slack key guitar for over twenty years and and has a number of awards to his credit. He can often be found in Hana, Maui, at any of the state's slack key festivals and perhaps having some "kau kau" at one of the island's ubiquitous food stands! READ REVIEWA Truly! Truly!! Truly!!! 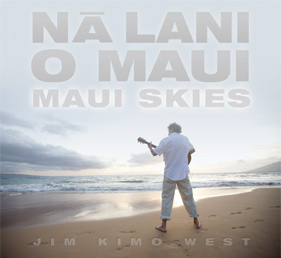 Magnificent and Beautiful album by The Master of the Slack Key Guitar: Jim "Kimo" West. Every verse, every chorus/refrain is played in a unique refreshing way. Wonderful anytime: Morning, Afternoon or Evening. Do yourself a favor and treat your ears to one Refreshing. Relaxing, and Fantastic musical collaboration. - Steve G.
A warm and island-influenced collection of original compositions and new arrangements of classic songs in Jim "Kimo" West's unique "nahenahe" style. With its superb recording quality and evocative sonic landscape, Hawaiian Slack Key Guitar: Kimo-Style reinforces his legacy as one of ki ho'alu's true masters and will undoubtedly prove that slack key guitar is still a living and evolving acoustic guitar tradition. READ REVIEWI have been to all islands of Hawaii and this music relaxes me from stress and makes me feel the warm Sun,the trade winds blowing,the waves crashing and I feel like I am laying in a hammock on the beach. Mahalo. - Lynn H.
Another great collection of uniquely original ki ho ‘alu instrumentals, with a few choice covers thrown in the mix. Like his initial outing, Coconut Hat, this album is full of warm, acoustic slack key instrumentals, based on his ever-evolving collection of experiences in the beautiful islands of Hawai’i, and showcases Kimo’s fluid technique and unusual tunings. READ REVIEWThink of Leo Kotke, Ry Cooder and John Fahey all rolled up into one guy. Ship him off to Hawaii for a gentle bake in the sun and surf... feed him tropical fruit drinks, invite him to luaus, let him enjoy the beauty of God's islands. You do this, and "Coconut Hat" is what you'll get back. I loved this recording... was immediately transported from the mainland back to the islands with their relaxed sense of time and nature, friendly people and a comfortable, casual lifestyle that suits me just fine. - Charles N.
A warm and relaxing instrumental travelogue of Maui’s enchanting Hana Coast. Full of melodic and mostly original compositions, this album showcases Kimo's fluid ki ho‘alu technique and engaging musicality. Standouts include original compositions Lanikele, Ulupalakua Sunset and Holoholo Helen Style. While honoring the great tradition of ki ho‘alu, he infuses these 13 tracks with his own rich musical heritage. READ REVIEWWow!! This recording is well done, Jim West is great with producing and playing awesome Eagles hits, This is A winner. Just plant a palm tree in the back yard and escape!! - Danny B.
Jim "Kimo" West’s second album for CMH Records is a warm and trade-windy tribute to the venerable LA band, The Eagles. Done in the old traditional Hawaiian style, Hotel Honolulu takes the great and memorable songs of The Eagles and infuses them with the warm tropical sounds of slack-key guitar, ukulele, steel guitar and Hawaiian percussion, (all played by Jim "Kimo" West) to create something completely new. READ REVIEWI want to say, I really like this CD. It features instrumental covers of Sublime's most famous songs. It makes for really nice background music, or goes well with driving to the beach. I do feel that the musicians did a good job of achieving what they were going for... a hawaiian sound, ukulele, steel guitars, etc, that happens to be sublime songs. But if you just liked sublime for frontman Brad Nowell's voice and/or lyrics you might not like this CD as much. - David S.
A warm and island-style tribute to the legendary California punk/ska band, produced (and primarily performed) by Jim "Kimo" West for the venerable roots label, CMH Records. This unique and very listenable CD features Kimo on slack key guitar, bass, 'ukulele and steel guitar with help from: Lee Ann Harris on percussion, the legendary Greg Leisz on steel guitar and Larry Antonino on the upright bass. These fabulously talented musicians have graced records by many hugely famous artists such as Beck, Fiona Apple, Matthew Sweet, k.d. lang, Joni Mitchell and Toni Childs. *Free shipping available only within United States. Signup to receive the latest news, tour dates & promotions. Autographed USB flash drive made from bamboo and pre-loaded with all current albums in hi-fidelity lossless AIFF format. Also includes the Unlimited Downloads Package for one year! Copyright © 2018 Jim "Kimo" West. All rights reserved. Want a great website too? Get 15% Off! Click here.